When I was a lad, telescopic rifle sights were pretty much limited to army snipers. There were a few in the civilian sector, to be sure, but many deer stalkers still regarded them as being somehow unsporting. How times change. Modern telescopic sights are superb, even the relatively cheap ones, so why even consider an alternative? Well, if you are a professional or need every possible advantage to complete your cull, the scope, like Essex, is the only way to go. But for the rest of us, the problem with high magnification models is that they are sometimes unhelpful at short range and can also encourage the unwary to take longer shots than they are truly capable of, resulting in wounded animals with a quarter-mile start on their pursuer. In my army cadet days, armed with a Lee Enfield, any distance out to 200 yards was known as “sights down,” ie point blank, with no sight adjustment required. The target was, although vertical rather than horizontal, about the same size as a deer. No problem. Young eyes are a big help with open sights, of course, but distance-wise, how many of us ever need anything more than “sights down?” In woodland, 50 yards is far more likely, 100 is a long shot and even out in the fields the range would rarely get anywhere near 200. From my own experience of deer stalkers coming on training courses, many, perhaps most, do not shoot well enough to be sure – and you must be sure – of making a killing shot at such a distance, even off sandbags. And those are the ones responsible enough to invest in some training, so God only knows what the rest are like. The mind boggles. For the keen amateur there are a number of alternatives to the 3x-14x monsters with 30mm tubes that we see around these days. 2.5x is ample for deer-size animals at 200 yards, even for eyes that have stared at sea horizons in the tropical sun for quarter of a century, without sunglasses. Such scopes also reduce weight and improve the look of the rifle. Leupold Scout scope mounted on Ruger No.1 .45-70. Clear of the action and clear of the eyebrow! Above is a photo of my Ruger .45-70, fitted with a Leupold 2.5x Scout scope, and doesn’t she look lovely? The scope has long eye relief so it can be mounted forward, clear of the action, which also makes it easy to shoot with both eyes open, improves target acquisition, and prevents the “Weatherby eye” which can happen with the usual mounting if you get your head too close. Then there are red dot sights. Not everyone finds them easy to manage, for whatever reason, but I love them and if you are trying to shoot deer rather than 1/4in groups on a target, they are more than precise enough at sensible ranges. Probably the fastest of all rifle sights and they weigh virtually nothing. This comparatively high-tech stuff is excellent but if we don’t really need it, even more money can be saved without in any way compromising our ability to see both sights and target. Welcome to the ghost ring. The best such sight I have ever used is the standard Mk4 battle sight mounted on the Lee Enfield No.5 Jungle carbine. Nobody had heard of “ghost rings” in those days, but that’s what they were. The sights were a big, broad blade up front and an L-shaped rear sight which could be tipped forward or back to reveal a large aperture for short range – “sights down” – and a smaller one zeroed for 600 yards. 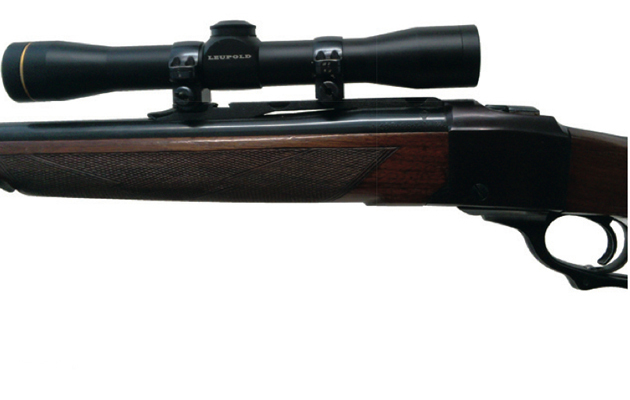 The sight, like the rifle itself, was designed for hunting deer-size animals in dense jungle with occasional clear areas. Woodland stalking? It was absolutely brilliant. The technique with these is the same as with any other open sight in that you focus your gaze on the big, black blade with the target, slightly out of focus, sitting on top. The rear sight, the ghost ring, is even more of a blur, but don’t worry about that because your eye naturally centres the aperture. If you think too much with these or with the red dot type, you’ll mess it up. Just sit your target on the foresight blade and let nature do the cunning stuff, she’s very good at it. of the correct height. Simple!